The campaign for a Nature & Wellbeing Act recognising the fundamental importance of the natural environment to our society and economy. 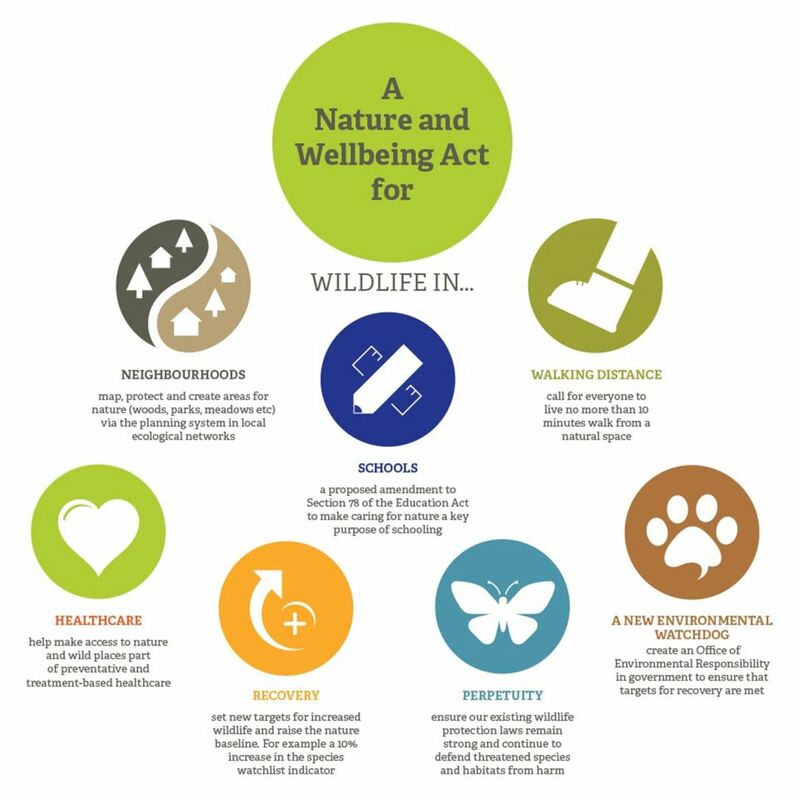 The Nature and Wellbeing Act was a proposed piece of legislation to bring about the recovery of nature in a generation, for the benefit of people and wildlife. Drafted by The Wildlife Trusts and the RSPB, and supported by over 20 partner organisations, we ran a joint public campaign asking politicians to Act for Nature. Over 9,000 people contacted their MPs about the Act (including every MP in England) before Parliament was dissolved on 31 March ahead of the 2015 General Election. But our relationship with it is in trouble. We believe that the restoration of nature - and the many ways this would benefit society - needs to be a central priority for the government. Nature matters to all of us, but the loss of wildlife is continuing at an alarming pace. 60% of our key species are in decline as is our own health and wellbeing; the two things are linked. With the RSPB as our partners, and the support of people like you, we called for a Nature and Wellbeing Act - to put nature at the heart of how our country is run, ensuring everyone enjoys the benefits it provides in our everyday lives. Read our Green Paper for more details. Broadly, it would: Improve the status of species and habitats; Place nature at the heart of decision-making, nationally, locally, and across all Government Departments; Link local action across the land to deliver resilient natural green spaces and ecosystems and; Better connect people with nature, with access to nature for all, and ensuring our children understand our natural world and what it does for us.